Remove camera sway, head bobbing and FOV zoom. For 1st and 3rd person. All animation left intact. Made for those who get motion sickness. No permissions needed to use any of my work and credits are optional. Fixed wrong camera angle on a few 3rd person sprints. Removed the behavior file, and ellimiate any conflicts relating to such. Fixed the wrong sprint for male. Both was previously female. Switched to using .bsa and adds compatibility to FNIS and the likes. Add fix to 1-hand block when using a single weapon, thanks to ilovecarpet for pointing out. Earlier versions are removed for redundancy. (Custom Attack Compatible) Fixed issue where camera rotates incorrectly while sprinting with 2h weapons. (Custom Attack Compatible) Added a version that works better with other mods such as FNIS. (Standalone) Works best without conflicts with similar mod. This mod will remove camera movement and FOV zoom in 1st and 3rd person modes. These are all the vanilla animations except now there are no camera shake, no head bob, no zoom-in when blocking with shield and more. - 1st person: Removed head bobbing and FOV completely. Retains footstep sound. - 3rd person: Removed head bobbing with FOV reduced to a very low minimum. Also retains footstep sound. - 1st Person: Removed all camera sway from every weapon type and hand to hand. - 3rd Person: Reduced all FOV to a minimum on all sprinting-attack and sprinting-power-attack. - 1st Person: Removed FOV that zooms in while holding the block on shields and all weapon types. - Both: Remove camera sway. Retains stagger animation (more noticeable in 3rd person). Note: Some animations still retains some positional movements for example "Block-Bash, Sneak-Attack" however all the swaying motions are gone. I'm unable to completely fix these motions, maybe I'll figure it out later as I dive more into the behavior files but as of now I'm unable to locate any changes. Kill Moves: I'm unable to make any advance in this area and will be looking into it with future release. If this is an issue for you there are mods and methods that will turn it off. 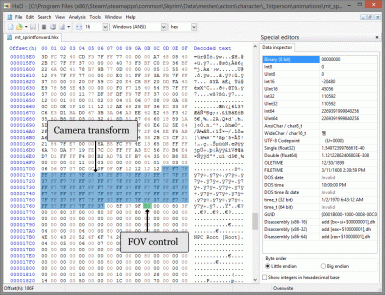 After hours of diving through the animation data in hex code I was able to recognize and locate the data chunk for AnimObjectA and Camera Control which are used for camera motions (swaying, bobbing, etc) and FOV zoom as seen in (sprinting, blocking) then by simply Zeroing out the values this eliminated the camera motion. - Add support for crossbows. - Fixed wrong sprint animation for male, both was using female previously. - Removed the behavior file, eliminating all conflicts relating to such. - Switched into using .bsa and fixed the issue with FNIS and other animation mods. - Added fix to 1 hand block while only using a single weapon, thanks to ilovecarpet for pointing out. - Earlier versions are removed for redundancy. 3/12/2019 - Added a (Custom Attack Compatible) version which is more friendly with such as FNIS. This version only includes modifications on non-attack animations and will not conflict with custom attack animations. - Version 1.0c: Fixed issue where camera will swing up and around while sprinting with 2h sword/hammer/axe. The vanilla animations are replaced with the non-shaky camera versions of this mod. 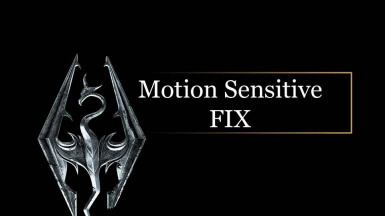 If you use custom animations with built in shaky camera then this mod will have no effect on those animations. This mod should be fully compatible with FNIS. Previous versions had problems because FNIS was able to detect my mod's animation but now I'm using a .bsa approach and it doesn't interfere with with FNIS update check anymore. Behavior file - This mod no longer uses such. If there are any issues with this mod or suggestions feel free to let me know. If you find any animation I may have missed please report and I'll add it to a later update. If there are any other knowledge of this topic please also feel free to share.